I study the effect of "galactic conformity" at both small- and large-scales. "Galactic Conformity" refers to the correlations between galaxy properties of central galaxies and those of neighboring galaxies. It spans two radial regime, i.e. "1-halo" (small distances) and "2-halo" (large distances) regime. I have analyzed the galaxy catalogues of the Sloan Digital Sky Survey (SDSS) and look for "1-halo" and "2-halo" galactic conformity. The rest of the analysis and a more in-depth discussion of "galactic conformity" can be found in Calderon et al. (2018). Figure: Difference of fractions of "quenched" satellite galaxies around "active" and "passive" central galaxies, as function of estimated group mass. 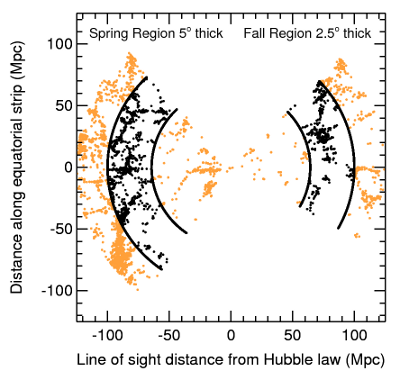 This figure shows the 1-halo conformity signal as measured in SDSS DR7, when compared to a set of synthetic catalogues with no galactic conformity built-in. I look at how group-finders can be used in galaxy/group catalogues, to better understand how galaxy properties depend on environment, group size, etc. In order to properly use these group finders, we need to know the possible statistical and systematic errors involved in the group-finding process. 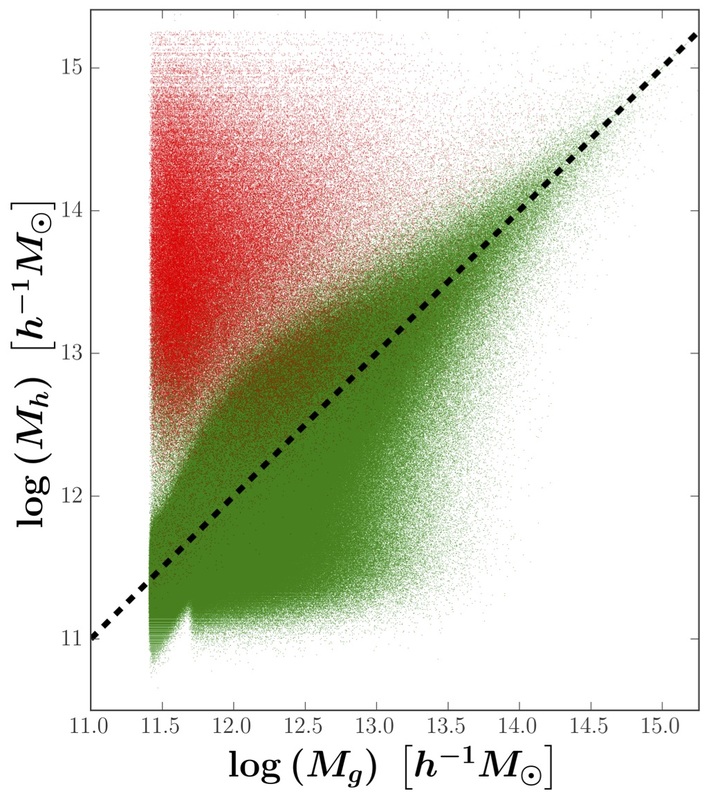 Figure: "True Halo Mass" (y-axis) vs "Estimated group Mass" (x-axis) for galaxy groups for a galaxy sample with galaxies brighter than Mr ≤ -19. 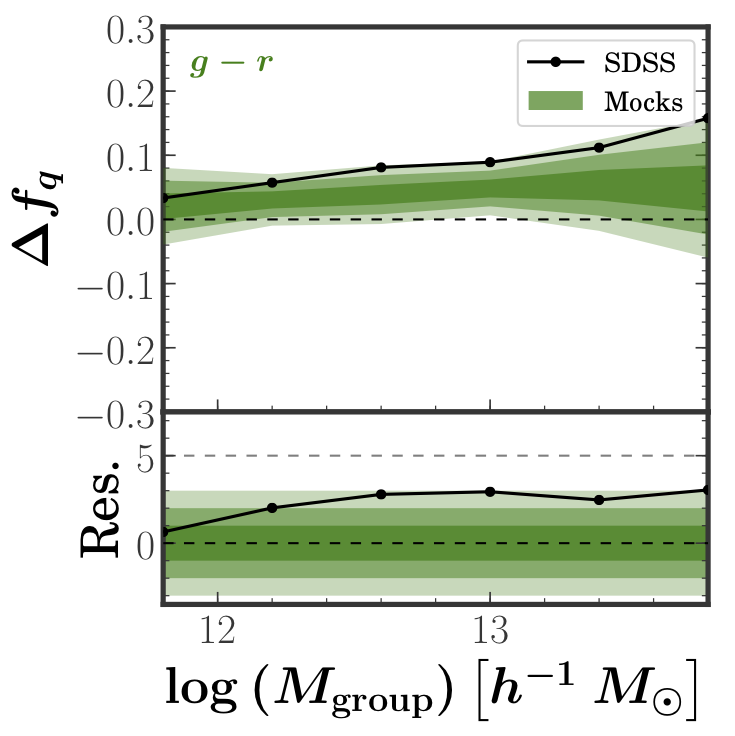 This figure shows how the "estimated" group masses (from the group catalogue) compare to the "true" halo masses of galaxy groups. I have created synthetic catalogues that resemble the RESOLVE and ECO galaxy catalogues. These catalogues were derived from N-body simulations, and designed to have the exact same geometry and number density as those of the real surveys. With the aid of these mock catalogues, one is able to characterize the systematic errors and statistical significance of a given measurement in the real catalogues.